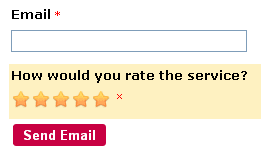 Use the Star Rating field to get feedback on your products/services from form users. In the form submission, you will get the number of stars they pick. To add a Star Rating field, go to your Form Editor → Specific Fields and drag the Star Rating field onto your form. Define the field label in order to tell users what it is that they should rate and you’re set. Can I change stars to a different icon symbol like pineapples? For the Star Rating feature we have available only two more options which are Children and Adults. If you have any other questions, contact us at support@123formbuilder and we will be happy to assist you. Is there a way to get the star rating system to show what the rating of that particular is to the user? As in 50 people have rated this page a 5 star, then when someone come to this page it shows that the page has a 5 star rating. I would love to know if this can be done. I apologize for replying this late. Unfortunately, we do not have such a feature, but I’d encourage you to submit it as a feature suggestion on our Features Request page. If it gets enough votes from other users, we might look it up and put it into development.